The fieldfare is a large, attractive thrush that is a widespread and abundant winter visitor to these shores. Most of the birds that overwinter here originate in Scandinavia and the number of birds and the time of their arrival varies from year to year depending on the severity of the winter and the state of the berry crop in their homeland. In milder years or if the berry crop is good fewer birds make the trip, if the weather is severe or the berry crop fails then they tend to arrive in large numbers. The fieldfare is an easily recognisable bird. It is large for a thrush – bigger than the blackbird and only slightly smaller than the mistle thrush. It has a distinctive grey head and rump that contrast markedly with its black tail and rich chestnut-red back and wings. Its light breast and flanks are heavily speckled with dark spots. The call made by the bird is a harsh, aggressive-sounding “chak-chak” and it has a chuckling song. On the ground it stands upright and moves forward with short, purposeful hops. Fieldfares begin to leave Scandinavia for the British Isles in October and November, where they will over winter on open ground bordered by mature hedgerows and woodland. Many of these migratory birds remain in Britain for the duration of the winter, but others continue across the Irish Sea, especially if the winter in Britain is a bad one. Fieldfares are gregarious birds and are often seen in large mixed flocks with other thrushes, particularly redwings. As a rule fieldfares feed on the ground scouring fields in search of their invertebrate prey, which they often locate by sound rather than sight. During very harsh weather, when invertebrates in the soil become inaccessible, fieldfares will eat windfall fruit and berries, and it is during these times that they occasionally turn up in gardens. 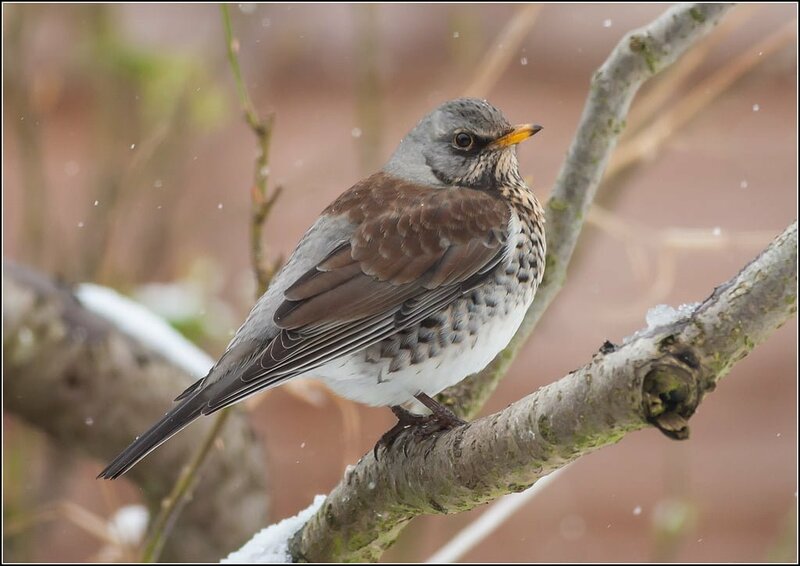 Garden bird-watch surveys both here and in the UK point to the fact that the number of fieldfares visiting our gardens varies significantly from year to year, and is likely to fluctuate according to the severity of the winter seen in any given year. On average about 750,000 fieldfares are thought to over winter in Britain and Ireland. Ringing studies have shown that overwintering fieldfares are nomadic, showing no allegiance to favourite wintering grounds. In successive years individual birds have been recorded more than 1,000 miles from their former winter locations. Fieldfares begin to leave for their breeding grounds again in March and the last of the stragglers are gone by May. Fieldfares breed in Scandinavia, the former Soviet Union and in central Europe. The range of the breeding population has been gradually extending southwards. Breeding birds reached Germany, Austria and the Czech Republic at around the turn of the century; Denmark, Belgium, France, Italy and Romania by the 1960’s, Britain and The Netherlands by the 1970’s and have been recorded breeding as far south as Greece. Breeding grounds appear to be as irregular as the birds’ winter haunts. Some years, for example, fieldfares are abundant in Lapland’s birch forests while in other years they are completely absent. They often nest in loose colonies and are renowned for their vigorous defence of these against predators. Fieldfares have even been known to ram magpies and jays in mid flight and some observers maintain that fieldfare “guards” are stationed on the periphery of nesting colonies to drive away would-be predators.